Unakite is a type of granitic rock that features mottled patterns of green epidote, white to gray quartz, and pink feldspar, occasionally with black veining. This compact, hard gem is most often seen as cabochon gems, carvings and beads or sold as tumbled rough. Stone can have a spot RI between 1.74 to 1.76 or 1.52 to 1.54 depending on which area is tested. 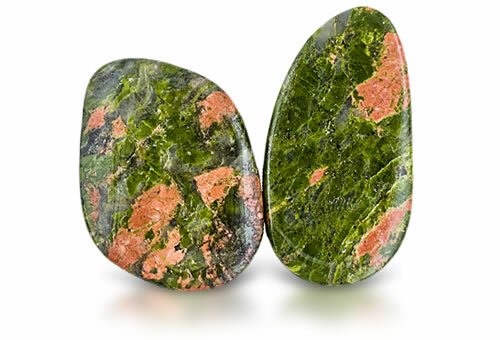 Unakite has a mottled green and pink appearance with black, white or gray veining.